No physical branches in the U.S.
At the moment, Barclays only offers U.S. customers savings accounts and certificates of deposit (CDs). Despite this limited selection of savings vehicles, both account types offer some of the highest savings rates in the industry. So whether you choose a traditional savings account or a CD, you're almost guaranteed to earn more than with a competitor (even a big bank). It's important to note that while easily accessible online, not all Barclays products are available to U.S. customers. So if you’re looking to open more accounts and keep them all in one place, Barclays won’t be the right bank for you. A huge banking name today, Barclays began with London goldsmith bankers in 1690. Over more than 300 years, Barclays has grown and implemented some groundbreaking services like the world’s first ATM. Today, Barclays offers credit cards, investments, loans and much more to customers all over the world. Barclays Online Banking business and the Barclays credit card and payment arm are located in Wilmington, Delaware. The Barclays Wealth unit is in New York City, while its Capital corporate finance business operates in more than a dozen U.S. cities. U.S. customers are currently limited to Online Banking features. Barclays maintains five core values for its business. These are respect, integrity, service, excellence and stewardship, meaning the company says it strives to prioritize its customers and their experience. Unfortunately, we are currently unable to find savings account that fit your criteria. Please change your search criteria and try again. You can use Barclays’ Online Banking services to help you reach your savings goals. You can start by using Barclays’ savings tools, to see which of its services might work best for you. You can also plug in your own personal savings goals to gauge how long it might take you to reach those goals. Barclays offers a few different kinds of savings vehicles. Its standard savings account, the Barclays Online Savings Account, earns interest at a high APY of 2.20%. You can also choose between various certificates of deposit. Each savings account from Barclays is FDIC insured up to the legal limits. Each account is also easily accessible through the Barclays website where you can log into your accounts to check on and manage them. Access to Your Savings Account Online and mobile banking or over the phone. Security FDIC insured, secured website. Fees No fees; penalties for exceeding the legal amount of six outgoing transactions. Update: Barclays no longer offers the Barclays Dream Account. Saving for the future can be tricky. Sometimes it’s hard to get started when we have other costs and expenses to keep up with. But that’s where a savings account comes in. Savings accounts provide a safe and guaranteed way to put away money. Not only that, but if you find a savings account with a solid rate of return, your money will grow in the account as well. Most banking institutions offer some sort of savings account. However, not all accounts offer a high rate, or annual percentage yield (APY). Barclays is one of the institutions that offers a rate that is well above the national average. You begin earning interest immediately on whatever balance you start with. There is no minimum deposit or balance requirement with the Online Savings Account. But of course you can’t earn interest on $0, so you’ll need to have some money in there. To make saving easier for you, Barclays provides the option of easily linking a bank account to your Online Savings Account. That way you can seamlessly deposit money from a checking account any time or by setting up a direct deposit. You can make a deposit either online, on your mobile phone or by calling Customer Care. You could choose to mail your deposits, but Barclays does not accept cash deposits or certain checks through the mail. You also have access to Barclays’ Savings Assistant which can help you figure out how to accomplish your savings goals. A savings account that could help you reach your goals faster, the Dream Account earns at a 1.20% APY. However, this account rewards you even further for responsible saving behavior. When you make consecutive deposits for six months, you earn a 2.5% bonus on the past six months of earned interest. Then if you make zero withdrawals for six consecutive months, you earn another bonus 2.5% on the past six months of earned interest. If you’re able to meet both goals, you earn both bonuses. Anyone 18 years of age or older can open an account. In fact, you can open up to three Dream Accounts. There is no minimum deposit or balance requirement, although you can only deposit up to $1,000 a month and when you open the account. Making deposits and transfers is the same process as with the Online Savings account, with online and mobile banking available to you as well as over-the-phone Customer Care. Access to Your CD In writing or over the phone. Fees No monthly maintenance fees; penalties of a certain amount of interest for early withdrawal or account termination. In addition to its savings accounts, Barclays offers a range of term length certificates of deposit (CDs). If you’re not familiar with CDs, they’re another kind of savings vehicle. However, they’re pretty different from your basic savings account. When you open a CD, you place your deposit into the account. Once you’ve done that, you cannot touch the account until it reaches maturity. Maturity is when the CD term ends, a length of time that you’ve chosen. You usually have a range of term length options from three months to five years. This kind of account ensures that you can’t dip into your precious savings at a whim. If you do, you face some hefty penalties. Barclays CDs range from three to 60 month terms. Each CD term length carries its own APY, increasing with the term length with interest always compounded daily. If you’re unsure which term would suit you best, Barclays provides a CD calculator so you can see how much your original deposit would grow over different time lengths. You also have the option to build a CD ladder. A CD ladder is a strategy where you open multiple CDs at the same time with various term lengths. That way you can have an almost-continuous stream of money. Some people even roll their earnings into another account to keep the growth going instead of cashing out. Barclays CD system can help you plan out your CD ladder. When your CD matures, you have a 14-day grace period to withdraw your funds or make changes to your CD. To withdraw the funds, you need to contact Barclays in writing or by phone within those 14 days. Barclays will be sure to send you a reminder of your CD maturity 30 days before the maturity date. If you don’t take any action, the CD will be automatically renewed at the same term length. While you cannot touch your CD before its maturity date without incurring penalties, you may receive interest disbursements from the account before it matures. This means you have the option of transferring the account’s earned interest into another savings or checking account, whether with Barclays or not. This is a good option for people who need money fast and not locked in a savings account. You could also choose to keep your earned interest in the account. Where Can I Find Barclays? U.S. customers can find Barclays online. Through its Online Banking arm (homepage shown here), you can find savings accounts, certificates of deposit and financial tools. You can also look into its other offerings like Barclaycard credit cards and other financial services like investment and corporate banking. Not all Barclays services are available to U.S. customers. However, you can easily reach Barclays over the phone, with a specific number for each branch and office you may want to contact. The phone lines are often staffed seven days a week from 8 a.m. to 8 p.m. EST. What Can You Do Online With Barclays? 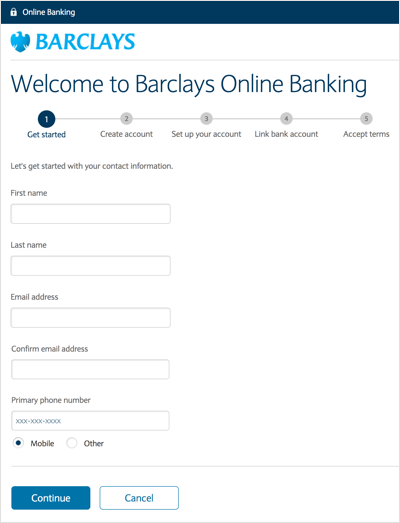 Everything that is available to you through Barclays is available online, especially Barclays’ savings accounts which are managed under Barclays’ Online Banking. You can open up accounts online, fiddle with financial calculators and learn more about the company and its offerings. Once you have an account, you can access it online by logging in. This is easily found on the homepage. Plus, Barclays guarantees secure online activity and transactions. How Do I Access My Money? 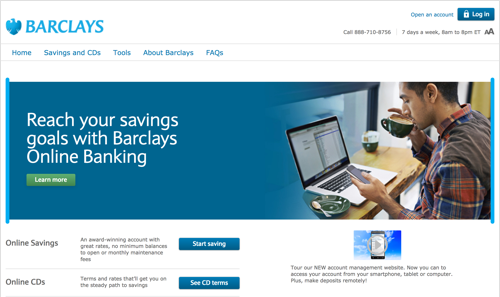 Once you’ve opened a savings account or CD with Barclays Online Banking, it’s easy to manage and access your accounts. Just go online to log into your account. There you can make changes and transfers or just check up on your savings. Don’t forget that you can only make six outgoing transactions with a savings account. If you go over the limit, you can face some unfavorable penalties. In the case of a CD that has reached maturity, you will be able to withdraw your funds by calling Customer Care or mailing in your request. How Can I Save More Money With a Barclays Account? Right off the bat, Barclays savings accounts and CDs boast some of the highest annual percentage yields in the industry. This means that no matter the amount you put into a Barclays savings account, that deposit can earn more than many of Barclays’ competitors. Big returns wouldn’t mean a thing if you also faced large fees for a bank’s services. Luckily, Barclays offers its savings vehicles at no extra cost to you for account maintenance. What’s the Process for Opening an Account With Barclays? Opening an account with Barclays is an easy and pretty standard process. You can do so online or over the phone. The first step of the online application process is shown here. You will have to provide personal information when opening any account. This kind of information includes your Social Security number, financial situation and contact information like a phone number and email address. During this process you will also have the option to link another bank account with your savings account. That way you can more easily and more quickly make deposits into your savings. The catch with Barclays is that it hasn’t yet wholly expanded in the U.S. There aren’t any physical branches in the U.S. that you can visit to speak to a person about opening an account or about issues with your account. Most of that takes place online or over the phone with Customer Care. Additionally, not all of Barclays’ offerings are available in the U.S. Barclays has separate websites for its U.K. and U.S. dealings and offerings. So if you are someone who wants to put all your accounts in one place, or who highly values in-person branches, Barclays may not be the right fit for you. Regardless of its minor drawbacks, Barclay’s best features - big returns with high APYs – will likely be extremely attractive to customers looking to open savings accounts or CDs. The savings account APY lands much higher than most other competitors. The 60-month certificate of deposit earns at an even higher rate. Pair those rates with the lack of fees and minimums and almost anyone can see their money grow substantially with Barclays.